This week on Spellburn, we’ll dive into a hot topic: How to win over the uninitiated to the game of Dungeon Crawl Classics RPG! 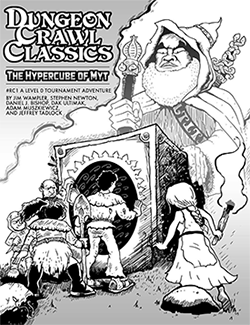 We’ve all been there before– trying to sell DCC to oldschool grognards, or devotees of newschool games. We’ll discuss how to prepare a game for newbies, whether at a convention or a FLGS. And we’ll talk about resources to find new players, as well as the differences between DCC and other systems and how to handle some common questions or perceptions. And if that’s not enough, we welcome a new judge to the fold! All this on Spellburn! Oh, Clerics *can* Spellburn, it just isn’t common and must be done with ritualized magic as opposed to standard casting (I’ve been able to utilize it exactly once – Thank you Brendan). I’ve always found that the lack of easy spellburn was countered by the ability to achieve divine intervention though. So, a 10th level cleric with 18 Personality has a maximum spell check result of 20 + 10 + 3 + 10, or 43. The highest spell check result for 5th level spells if 40+. Correct. But what I said is the 2nd and 3rd highest results aren’t (practically) usable. A 19 result is 19 + 10 + 3 = 32 – meaning you cannot get the 36-37 and 38-39 results without permanently burning 4-6 points of Luck. If the cleric’s Personality is below 13, the 30-35 result isn’t achievable either. What if there is a halfling watching him cast? Actually, what if the result is 20 + 8 + 3 + 8 = 39? The 10th level cleric is not the only one who can roll a “20? Likewise 20 + 7 + 2 + 7 = 36.
varies depending upon the spell check result. rounds, but gains an acid spit that can be used as a ranged attack: Spit 10’ +2 ranged (1d10 + corrosive). the dice chain each round. Succeeding an initial DC 13 Reflex save will halve damage for each round.